A one-time price of $63.00 will be added to your order. 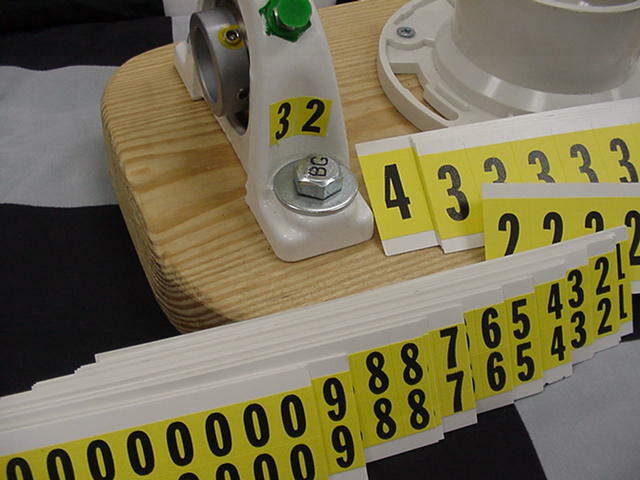 Peel-off laminated polyester number sets have three cards each 0 through 4 and two cards each 5 through 9. Black numbers on a yellow background. Ideal for environments where the numbers will be exposed to moisture, dirt, oils and mild solvents. Appropriate for application to flat or near flat surfaces that are clean before application. Not designed to be re-positionable because the adhesive bond strengthens, making them difficult to remove. Can be used indoors or out.